PlayatMcD.com – Mcdonalds Monopoly 2016. You Could WIN $50K Dollars Cash Online – You can enter it now! 2016 MONEY MONOPOLY GAME AT MCDONALD’S play the 2016 MONOPOLY at PlayatMcD.com. Enter your Code below to track your properties and for a chance to WIN! US McDonalds Monopoly. Indeed, with the Online Sweepstakes Customers have four additional chances to win $50,000 by entering the online code found each game stamp at www.playatmcd.com in the weekly MONEY MONOPOLY Online Sweepstakes. Something great about 2016 is the fact that even if you don’t pull a winning piece you still have a great chance to win with McDonalds Monopoly Online Codes 2016. McDonalds Monopoly Game is coming back again this year with fantastic prizes! Will you be lucky this year? Starting March 29th 2016 MONOPOLY Game at McDonald’s will amaze you this year with prizes like $1,000,000 cash that will be awarded as a $50,000 check each year for twenty 20 years and many more prizes.. Indeed This year, the game offers the chance to win many prizes, including cash, food, gift cards, travel, car and more. See the list below. About Rare Pieces for Money Monopoly in 2016, When it comes to McDonalds Monopoly the rare and hard to find pieces and those are the one that could make you a winner. Mcdonalds Monopoly Game has become an annual event that people look forward to. McDonald’s has delighted millions of winners with Monopoly game at McDonald’s through the years, the game continues to provide a fun experience and surely including the chance to win great prizes by collecting pieces and playing the boardgames. McDonald’s is the world leader in the industry of fast food services and has started this marketing venture with Monopoly Game in 1987 with great success. A sweepstakes advertising promotion of McDonald’s and Hasbro company. The promotion mimics the game Monopoly offering the challenge to participants of collecting pieces to improve their chances to win a prize. Some Mcdonalds monopoly rare pieces – Rare McDonalds Monopoly Stickers & Pieces 2014 maybe you will the one that get one of these rare pieces. Good luck! 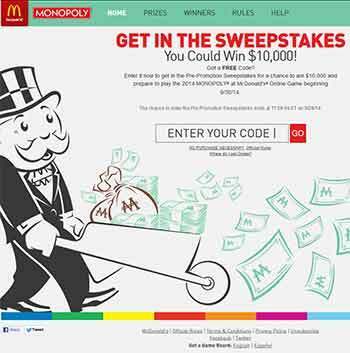 Have You Won in McDonald’s Monopoly Sweepstakes? How to Increase Your Chances at McDonald’s Monopoly Game? Please see official website PlayatMcD.com and iwonatmcd.com for more details. Collect Mediterranean Avenue (#601) and Baltic Avenue (#602) to win a prize of Fifty Dollars ($50) cash. Collect Oriental Avenue (#603), Vermont Avenue (#604) and Connecticut Avenue (#605) to win a prize of One Thousand Dollars ($1,000) cash. Ten (10) prizes are available in the Game. Each winner will receive a check for $1,000, ARV: $1,000. Collect St. Charles Place (#606), States Avenue (#607) and Virginia Avenue (#608) to win a prize of Two Thousand Dollars ($2,000) cash. Ten (10) prizes are available in the Game. Each winner will receive a check for $2,000, ARV: $2,000. Collect St. James Place (#609), Tennessee Avenue (#610) and New York Avenue (#611) to win a prize of Five Thousand Dollars ($5,000) cash. Five (5) prizes are available in the Game. Each winner will receive a check for $5,000, ARV: $5,000. Collect Kentucky Avenue (#612), Indiana Avenue (#613) and Illinois Avenue (#614) to win a prize of Ten Thousand Dollars ($10,000) cash. Five (5) prizes are available in the Game. Each winner will receive a check for $10,000, ARV: $10,000. Collect Atlantic Avenue (#615), Ventnor Avenue (#616) and Marvin Gardens (#617) to win a prize of Twenty-Five Thousand Dollars ($25,000) cash. Five (5) prizes are available in the Game. Each winner will receive a check for $25,000, ARV: $25,000. Collect Pacific Avenue (#618), North Carolina Avenue (#619) and Pennsylvania Avenue (#620) to win a prize of Fifty Thousand Dollars ($50,000) cash. Five (5) prizes are available in the Game. The winner will receive a check for $50,000, ARV: $50,000. Collect Park Place (#621) and Boardwalk (#622) to win a prize of One Million Dollars ($1,000,000)* (*payable $50,000/year for 20 years, without interest). One (1) prize is available in the Game. The winner will receive a check for $50,000 each year for twenty (20) years, without interest, ARV: $1,000,000*. Collect Reading Railroad (#623), Pennsylvania Railroad (#624), B&O Railroad (#625) and Short Line (#626) to win Five Hundred Dollars ($500) cash. Two Hundred (200) prizes are available in the Game. Each winner will receive a check for $500, ARV: $500. Online Sweepstakes Prizes/Odds/Details: Fifty Thousand Dollars ($50,000) Cash. Five (5) prizes are available in the Sweepstakes, one (1) prize available each Entry Period. The verified winner will receive a check for fifty thousand dollars ($50,000), ARV: $50,000. See Official McDonald’s website for the exact Details. Good Luck! Iwant to win Colleck Park Place #621 1Million and Board Walk #622 50,000 Thank! Would love to win and I am trying to do just that. Hopefully I will. Like I just wrote above you will find your answer at mcdonalds.ca or you can enter your Game Stamp Codes at PlayAtMcD.ca Good luck! I’m eager to start this new collection of McDonalds Monopoly Game pieces 2013. Hope I will win big this year.